New organizational foundations were laid in the late 1970s and early 1980s, rooted in the segregated communities but committed to a non-racial future. Students once again took the lead, as veterans of the 1976 uprising now armed with both concrete experience of struggle and counsel from the elders. “We were planning to form a new student body, you see, and questions were coming up as to how are we going to avoid the problems we experienced in June 1976: firstly, the relationship of the students to the society as a whole, and secondly, the shortcomings of the tactics and strategies which were involved. There had been no change, really, since 1976, in the attitude of the people. They were still anti-white, you see. Now it was felt that this new organization which is going to be launched should not appear to be racist. In actual fact, it was not going to include whites at that particular stage, but in terms of policy, we had to make it clear that we are non-racial. But it was not as easy as that to introduce non-racialism — it now meant that COSAS had to start moving people away from Black Consciousness and start showing them the non-racial way. Our argument was that it is not all the whites who enjoy privileges — there are whites who don't enjoy privileges. And secondly, we cannot deny that there are those whites who are well off but who are sympathetic to our struggle. We used to put forward such arguments to try and show them that, in actual fact, the problem is between the rich and the poor, because you actually find even blacks who sell us out. And now the whole class question would come in. One of the other problems was that in 1976 and '77, very few so-called coloureds and Indians were involved, so our first aim of COSAS was to go to those areas and draw them in. And that's exactly what we did. What led to the decision that COSAS should formally adopt a non-racial policy? You see, initially what had happened is that since we were planning to launch a new organization, we had to consult elderly people and experienced people. And in actual fact it was them who showed us our shortcomings in 1976 and 1977. They were trying to show us that we are going to find ourselves in a racist problem if we are going to pursue BC. In 1979 already there was ANC literature coming up, you know, there was an ANC vibe growing inside the country. ANC started intensifying 'armed propaganda’. Now this was helping to sort of change the mood. It is clearly stated in the COSAS constitution that we are striving towards a non-racial and democratic education, first as oppressed, then as students. COSAS also realizes that for there to be a non-racial democratic education there must be a democratic society truly reflective of the will of all the people. The preamble of our constitution clearly states that 'students have a responsibility toward ensuring the welfare of society'. Here the organization has isolated a particular and fundamental responsibility: the economic responsibility. Students realize that the clothes we wear, the food we eat, the pens and books we use are produced by the working class of our country — the working class is therefore responsible for the wealth of the country. Yet we find that those who produce the food have no food, those who produce the clothes have no clothes, those who build the houses have no houses. The working class, as the oppressed and most exploited class in society, therefore must first emancipate themselves, since the emancipation of the working class will ensure the emancipation of society as a whole. That is why we are saying that the working class is the vanguard of our struggle. We, as students, through having our site of struggle on our schools and campuses, can only play a supportive role to our parents, the workers. “I've been non-racial ever since my involvement in COSAS, since its inception. The COSAS constitution was drawn up in my presence, and I fully participated in its formation. I never had problems with whites because we were a non-racial organization from the outset. He then tried to explain the policies of the ANC to me, and he trained me politically. The type of training I got from this comrade was so clear that I immediately understood that not every white is an enemy, especially when he explained to me about the two opposed classes, the working class and the bourgeois class, and how whites are being given privileges to divide the working class, and as a result, weaken it. What also convinced me was that if we say we are going to drive the whites to the sea, I mean, why should we do that, because South Africa is what it is today because of our joint effort. Was it common to talk so freely about the ANC in the late 1970s? I think from 1979, people were very free inside the country to talk about the ANC. I was arrested because I was on the national executive of COSAS and it was believed that COSAS was a front of the ANC — which was not true. COSAS was a student movement and happened to be having very clear political directives, aspiring to a new, democratic South Africa, and it so happened that its constitution, its beliefs, its aspirations are that of the ANC. Did COSAS have to try not to appear to be linked with the ANC? The philosophy and policies of the organization will be based on the broad provisions of the philosophy of Black Consciousness. We recognize the fact that in our country, race is a class determinant. Thus the concentration of economic and political power in the hands of the white race enables it to promote a rigid class structure. The black people, on the other hand, constitute a people racially discriminated against and economically exploited. This gives rise to the ever-increasing conflict between the white and black races. The white race accumulates capital by exploiting the black labour, and by virtue of their possession of political power they maintain themselves in a position of privilege. We envisage a state where all persons shall have the right to ownership of property and complete participation in the political machinery of the country, where capital and profits accruing from labour shall be equitably distributed. We believe that the entire country of Azania belongs to the black people, hence our vehement rejection of the bantustan policy. “One thing that changed me was at the time when we were going to introduce AZAPO here, we realized that the police were strongly supporting our slogans. And we started to doubt now: why should the state be so arrogant against the ANC and show us how effective PAC could be, with its hostility against whites and so on? You see, in 1980 I was arrested together with executive members of AZAPO from the Transvaal, and we saw this was a calculated plot to try and tell us how good Black Consciousness is. These AZAPO fellows denounced the ANC so much, and the non-racial principle. When I came back from detention I realized firmly that no, we are being trapped here. Fortunately, elderly people here in PE [Port Elizabeth] stood up against this now, the old people who were in the ANC. There were these fellows who had just recently been released from prison, Robben Island, and they were instrumental in explaining this non-racialism to us. And then we started to realize, hey, but these people are talking sense now. There was that general lull amongst these fellows who were arrested and imprisoned — before they were silent when they came back, but now their goal is to give direction to the youth. From that time, really, things changed dramatically. All the organizations immediately developed here in the Eastern Cape. They just worked for this non-racial business, and everybody started to understand. And then immediately we embarked on a campaign to expose this, and to learn a lot about non-racialism. And we understood then. As from 1981, I am telling you, we were very clear. And we are convinced now. What would be the motive for the government to support AZAPO and oppose the non-racial organizations? By the end of 1979, another student group had been formed, this one aimed at black university students.viii While many of its members had 'grown out of' Black Consciousness, the Azanian Students Organization's name reflected the continued need for a degree of caution in moving towards explicit non-racialism. “The formation of AZASO was not at all representative of the student fraternity in South Africa. Only one campus was represented: Turfloop. The whole idea was originally proposed at an AZAPO meeting, so as such there was an AZAPO influence. We did discuss this at Fort Hare and other areas, but we felt that since a student organization has been formed we mustn't debate and indulge unnecessary issues. We felt that we all had to support it and give it a thorough and a proper direction. Do you think that when South Africa's free it will be called 'Azania'? 3. Since the success of our struggle depends upon effective mobilization of all people committed to democracy, we call for genuine unity of the oppressed against the oppressive system. It took a year of what AZASO members later described as 'serious debate, informed by our experiences in the field of struggle' and 'signifying the maturation of our theoretical position' for the organization to totally discard Black Consciousness, adopt the principle of non-racialism and endorse the Freedom Charter. AZASO's leaders then boldly initiated the first public black-white student cooperation since the walk-out from NUSAS that had sparked the Black Consciousness Movement a decade before. “A number of campaigns were very important for that process of starting to cement alliances between black and white students: firstly, the Freedom Charter Campaign of 1980, which we ran in conjunction with COSAS. We had the resources and we had access to money, and they would approach us and say, 'We need 10,000 pamphlets for tomorrow,' and we would print them and see that as our role, as a support for student struggles. Another area of struggle, particularly in Cape Town, was the support for labour struggles, particularly the Fattis and Monis [food workers] strike which was taking place at the time, then later on the meat strike with the General Workers Union, and then later on still, the SAAWU [South African Allied Workers Union] strike and the Wilson-Rowntree sweet boycott which we organized on campus. We printed posters, pamphlets, we had demonstrations. But I think our biggest achievement during 1980 was bringing the University of Cape Town out for a whole week of boycotts in solidarity with the black school boycotts. A lot of black students would come onto campus, both at UCT and at Wits [University of the Witwatersrand], and inject a spirit of militancy into the white students. We would do this deliberately, to try and start non-racial alliances going, and try and break down this notion amongst white students that their only role was in the white community. I think that whites, at that stage, were playing a disproportionately important role, in terms of national politics. Like the Freedom Charter campaign — the fact that NUSAS ran that nationwide meant that Freedom Charters got not only onto the campuses, but into all the schools and the communities, often for the first time since the 1950s. A lot of the black leadership was still banned at that stage and I could travel around. I'm not saying this to exaggerate our importance — because that's a very dangerous thing — but I think NUSAS at that stage, together with COSAS, played quite an important part in reviving the non-racial tradition from '79 onwards. Look at the Free Mandela campaign of 1980, and the following year the Anti-Republic Day campaign which was the first of the series of broad front coalitions against the government — where we had the emerging trade unions, COSAS and AZASO, we had the Natal Indian Congress, we had the Black Sash. NUSAS printed over a million Anti-Republic Day pamphlets, flags were burned at our meetings, and I was then detained, having done a nationwide tour with Wantu Zenzile, the COSAS President, and speaking on the same platforms. I think I was the first NUSAS President to speak on a black campus since the 1960s, when I spoke at Durban-Westville [Indians only university] at the beginning of 1981. The black comrades that I was working with were very apprehensive that this would be rejected. They thought maybe they were in the minority, that BC was still going to say, 'Ag, we don't want this NUSAS president on our campus,' but the meeting was packed out. It was the first time that I gave an Amandla salute — I mean, in those days you just didn't do those sort of things. I remember the Security Police later interrogating me for two days about why had I given a 'black power salute' since I was a white person. A resistance rally has been organized by the three major student groupings in South Africa — COSAS, NUSAS and AZASO. Together they form the non-racial student movement in this country. While it has been necessary to organize separately because of the practical and ideological effects of apartheid, we are all striving for a South Africa based on a single, united and democratic future. Our vision is encapsulated in the Freedom Charter. As the government cracks down on all resistance, it is more important than ever that we stand together and show our opposition to apartheid. We call on all students to attend the rally so that we can build non-racialism in the process of our struggle. Another student organization in the vanguard of non-racialism was the Young Christian Students, the South African affiliate of an international youth movement. YCS had included both blacks and whites in its membership and leadership since reaching out to black high schools in 1979. “One of the things about religion is that we don't have a political policy in any way or a blueprint for the future, but we do have a vision of a just society. And in a South African context, there's no doubt about it, our vision would have to be a democratic society, one person, one vote. It has to be a non-racial society, and not a multi-racial society where you've still got groups where their interests balance out against one another in some formula or other that's not going to bring peace. Non-racialism means that race is as irrelevant as creed or gender or anything else. “I used to subscribe to the BC ideology very strongly, but the change came in when I joined YCS. It was exciting to hear priests speaking a different language, interpreting the gospel differently. Before I was a staunch Catholic, I used to go to Mass every Sunday and I was in charge of the altar boys in the church, but I wasn't seeing that the struggle needs to be brought into the church. I was starting to understand the system much more because of the type of publications I used to get from YCS. I started to understand the problem is to fight the system that makes white people hate us, and have a new system that will bring about human values, like non-racialism and so on. So one started to realize that we can kill as many whites as possible, but you are not changing the system. You can have actually the same system, but not run by white people, run by black people. Like in other countries like Kenya, for instance: the system hasn't changed that much, people are still poor, opportunities for education are still restricted to very few people, the middle class and the rich people. And also my participation in YCS exposed me to white people who were involved in the struggle, and that was quite a surprise, you know. I remember one day a white comrade came to my place and he talked to my mother about Mandela, and she said it's the first time she hears a white person wanting change in the country. Realizing that there are whites who support the struggle, that actually reassured me that we are not fighting white people as white people, but we are fighting the system in which white people participate and are being used against us. Were there any problematic issues? The non-racialism now entrenched among the students spread into the community, as civic, youth, women's and popular media structures evolved around struggles over issues like jobs and rents. By the late '70s it was quite clear to us that you couldn't go back to Afros and wearing dashikis [African shirts] and saying — in a very sexist way — ‘Black man, you're on your own.' I personally decided that I should now get into class. And I started reading Marx's Capital and waded through two volumes before I realized that I was not going to understand class struggle by reading Capital. Then we started seriously looking into our past, approaching questions of how we view the participation of the different racial groups in a racially divided society like South Africa. We started reading the Freedom Charter. Now the Charter before had always been a fairly symbolic document to us: now we started analyzing it. “In early 1983 I was detained and the issue that they were trying to pin on me was that AZASO is a front for the ANC, and so is COSAS and so on. That interrogation, in some sense, confirmed the correctness of the policies we had adopted, because one could get a feeling that they weren't afraid of exclusive BC politics — what they were afraid of was non-racial politics, or a politics that was starting to be based much more on class analysis. The Security Police were starting to become very aware of the links that were being formed between NUSAS and AZASO and COSAS and the United Women's Organization (UWO). They would ask: how can you work with whites? Aren't whites the problem in this country? I got the impression that it was not just a case of an ascendant ANC that they were having to deal with, but they were also having great problems with the new non-racial politics. I don't know if it was fear in terms of us making cracks in the ruling class, or whether it was just an inability to cope with the fact that blacks and whites were mixing on equal terms and working and living together. We didn't call ourselves ‘Charterists' ever — that's what we were called by BC people. We would say we are non-racial, and non-racial meant Congress movement, ultimately. So it was more that resurge in non-racialism, a resurgence of Congress politics. I think the authorities had a notion that if you were BC you were PAC, and if you were non-racial you were ANC. The main emphasis during interrogation was: 'You've got a good career in front of you, why don't you stick to that? Do you know what the ANC's all about, really? I mean, do you know what Tambo and them say about you Indian people?' They went on, saying, Saleem, you come from a civilization — we can get on. And you know changes are coming. We can come together — you as Indians, and maybe the coloureds as well. We whites can come together, but these blacks will never be able to come together — never, never. And if you think the ANC's going to be able to bring everyone together, forget it, because the ANC is just Xhosas.' I mean, that's always in their arsenal, to play out that sort of theme. Non-racialism opens up a whole new sort of dimension, in terms of how you need to mobilize and organize. You come to a greater understanding of the state — that it exists at the level of the education system, the health system, the administration in the townships, and those are the levels at which you need to start focussing, on a day-to-day basis, in terms of building unity of the people, around bus fare increases, around rent increases, around gutter education. And in doing that you start to dent the structures wherever they exist. That sort of perspective isn't there at the level of BC — it flows out of a class analysis, a greater understanding of capitalism and state power. And I think above all, it's not simply the state as a monolithic structure which can repress you and control every aspect of your life. There are areas that you can challenge, and areas that you can roll back in some sense and make gains. “For people in an area like the Free State, what is important is the alleviation of the problems they are confronting. The very question of non-racialism, the way it comes into the picture is: what is the root cause of the problem? If in the struggles that people have gone through they have come to understand the root problem not as being the white person or the person's race, it is going to be difficult for that person to accept anybody who comes and tells them, no, the problem is the white person. Throughout a worker's trade union activity, the lesson that he came to learn was that the root problem is the question of distributing the resources of the country unfairly. This is experience. It becomes intellectual if it does not reflect itself in practice. If in practice, however, people begin to come to grips with the root cause of the problem,that is what literally removes the rug from under BC perceptions. “From the experience that I have had in our organization, I think the most unifying fact is that we are women, and that comes before the fact that we belong to different race groupings. The Natal Organization of Women is one of the few organizations that are completely mixed. Most organizations are not mixed, even though they believe in a non-racial democratic South Africa, because of the nature of their formation. Take, for instance, JORAC. JORAC is a residents association and it is based in the townships, so it is all black. Take, for instance, the Natal Indian Congress: it is all Indian. For the government, the revival of mass political organization was a worrying sign, especially as it resulted in growing community support for labour issues. Even more alarming was the resurgence of a tradition of alliance politics, coupled with sporadic yet ever-increasing ANC guerilla activity. In 1983, the state responded to these mounting pressures with a constitution aimed at reforming, but not abolishing apartheid. Coloureds and Indians were to be represented in two new chambers of parliament, with whites continuing to dominate and Africans still locked out. This attempt to thwart the budding non-racial alliances by co-opting coloureds and Indians into the ruling bloc failed. Instead it prompted the formation of the most powerful legal anti-apartheid body since the ANC in the 1950s: the United Democratic Front (UDF). Whereas the constitutional reform proposals devised by the minority white government for South Africa avoid recognition of these fundamental needs of democracy, now therefore we democrats do hereby unanimously form ourselves into a united democratic front to oppose the implementation of this devious scheme disguised to divide the people. • a recognition of the necessity to work in consultation with and reflect accurately the demands of democratic people wherever they may be in progressive worker, community and student organizations. The participation of a tiny minority of coloureds and Indians in the 1984 elections for the tricameral parliament pointed up the critical function of black collaborators in making the system work. 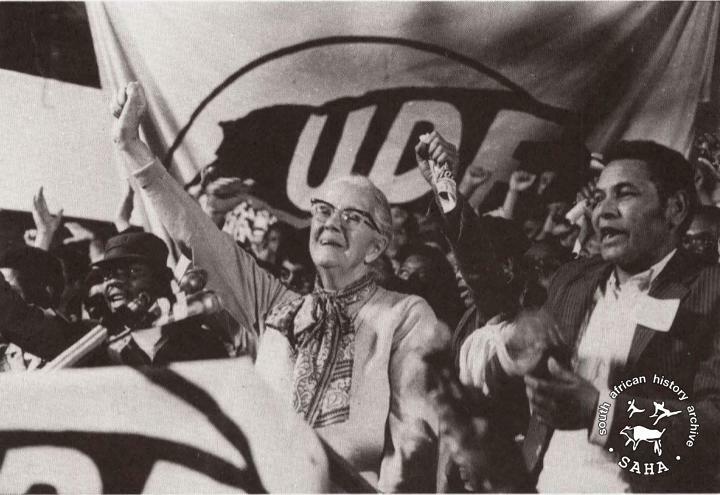 The UDF's successful election boycott demonstrated how building anti-apartheid alliances could ensure that the system broke down. Developing the theory and practice of 'broad front' politics was the UDF's main preoccupation in its five years of existence, until the government banned its key affiliates in 1988. ‘Building the front' is more than building the UDF itself, and more than working closely, if not merging in some cases, with our natural allies. The UDF must seek to extend its political and moral influence far beyond these limits to include the widest possible range of South Africans. This means developing the capacity to intervene politically on the smallest localized instances of oppression and exploitation, up to the broad national issues. In the first place, this broadening of our influence must be directed to the people's camp — to the ranks of all oppressed South Africans. To carry out this task successfully, we must ensure that we work much more consistently with groups that are not immediately drawn into our mainline sectors: trade unions, youth, women, civics and students. Our relationship with taxi-owners, traders, sports bodies and religious and cultural groups has often been very unsystematic. We must conduct work on this front in a much more coordinated, principled and strategic manner. To give an example, we tend to approach traders each year early in June. We ask them to observe June 16th and June 26th by closing their businesses. And then we don't speak to them again until just before December 16th, xv When there is going to be a large political funeral in distantownship, at the last moment we suddenly ask cooperation from taxi-owners for transport. This cooperation must be deepened into a purposeful, structured, political relationship. Of course, we shall continue to affirm the need for working class leadership on all fronts of the struggle. To call for progressive initiative from traders is not a call for them to lead our struggle. But nor do we think it healthy if traders, taxi-owners, black business people, sports clubs, etc. are treated in an unstructured, or even opportunistic way. All these groups must be won over politically — otherwise some may even become a recruiting base for the vigilante death squads,xvi or for apartheid's local authority structures. But broadening our political and moral influence must go beyond the people's camp. We must increase our influence over sectors within the ruling bloc. At the national level, our call before the whites-only election was a good example of what is meant by seeking to broaden our political and moral influence within the ruling bloc. This call endeavoured to address a wide range of whites, but perhaps even here we were not comprehensive enough. We failed to address white workers in Afrikaans — the language they mostly speak — around the issues, grudges and grievances that concern them. We failed, therefore, to snap the connection between legitimate grievances — to which we alone have the solution — and the racism within which the ultra-right wing parties opportunistically embedded these problems. By its very nature, this very widest level of broadening the front will produce uneven results. Many of the sectors to be addressed within the ruling bloc may well join us on one specific issue and betray us on the next. But this does not mean that work on this, the broadest front, is pointless. Our duty is always to deprive the enemy of every support base and of every potential ally. To the extent that we render some of the regime's natural allies wavering and untrustworthy for it, that in itself is a gain for our national liberation struggle. 1. What have the democratic organizations in your area done to extend their influence to this broad range of organizations? 2. Discuss what is meant by the paper when it says these groups must be won over politically, rather than in an opportunistic way. 3. The paper also says our political approach should 'deprive the enemy of every support base, and of every potential ally'. Have you done this in your area? i The Umkhonto we Sizwe campaign against symbolic government targets — e.g., police stations, power installations — which became a focus of media coverage from 1979.
ii Although much lobbying for the non-racial policy took place on an inter-personal level, non-racialism was not strongly emphasized in early COSAS media. This tactic was motivated by a concern to avoid alienating former SASM members still loyal to the BC tradition. Note that while the organization's non-racial policy dates back to its founding document in 1979, the constitution referred to here was adopted in 1983.
iii Central Police headquarters in Johannesburg, infamous for Security Police detentions, interrogations, torture and deaths. iv In its first year, COSAS took up two commemorative campaigns that the authorities saw as ANC-supporting: the 1978 hanging of MK guerilla Solomon Mahlangu, and the centenary of the Zulu victory over British troops at Isandhlwana. v Jolobe was one of a small but growing number of female leaders in black political organizations in this period. vi Those arrested included Lybon Mabaso, Ishmael Mkhabela and Sammy Tloubatha. vii The first COSAS president, Ephraim Mogale, was arrested, tried and convicted of furthering the aims of the ANC in the Northern Transvaal. So many COSAS leaders and members were detained over the following years that often the entire COSAS executive would be in jail, underground or out of South Africa, having fled the country. viii AZASO was active in both the whites-only and blacks-only universities (the homeland universities, as well as the coloured and Indian campuses). By the late 1980s, the proportion of blacks studying at the nominally whites-only universities was nearing twenty per cent at many campuses, but by law blacks still had to apply to the government for permission to study subjects not offered on the black campuses. ix This historical perspective on the organization is contained in the South African National Students Congress (SANSCO) National Newsletter, First Quarter, 1988. The newsletter goes on to explain that, 'The final break with our BC origins came at the 1986 Annual Congress, where the name of the organization was changed from AZASO to SANSCO.' SANSCO and NUSAS began working towards a merger of the two organizations following a decision taken by both at their annual meetings in late 1989.
x A nation-wide protest against the government's celebration of the twentieth anniversary of the transformation of the Union of South Africa into a republic. xi In this chapter the University of Durban-Westville is described as an ‘Indians-only’ institution, and the University of the Western Cape as ‘coloureds-only’. This was certainly the intention of apartheid higher education, and the overwhelming number of students at these universities still fall into the designated racial category despite a trend towards non-racial admissions policies. xii The development of YCS in South Africa was spurred by the Young Christian Workers (YCW), a movement started in Belgium in 1923 and introduced to South Africa in 1959, as well as the National Catholic Federation of Students (NCFS). By 1980 YCS was mainly active in black high schools, and in 1981 its organizing extended to black universities. Its three 'options' or principles are: the option for the poor, the option for liberation and the option for non-racialism. xiii Western countries also seemed to favour Black Consciousness over non-racialism. An article entitled, 'US Quietly Aids South African Black Activists', Los Angeles Times, 11 November 1986, concludes that, 'Much U.S. money is going to Black Consciousness groups, many of them small, rather than the larger organizations that look for political leadership to the exiled ANC and the UDF inside the country.' Journalist Michael Parks quoted a US official visiting South Africa from Washington DC as saying, 'After liberation, we want to see a politically pluralist society in South Africa. Frankly, we don't want apartheid replaced with some system modelled on East Germany or Bulgaria. Naturally, we try to help those whose interests coincide with ours.' According to Parks, the key figure in an unpublicized US-sponsored S1.1-million leadership development programme was a former president of AZAPO. xiv This motion was mooted at the Transvaal Anti-SAIC (South African Indian Council) Conference, spurred by a speech by Revd Allan Boesak urging the formation of a body to fight the government's constitutional reforms. The UDF was launched in Cape Town on 20 August 1983.
xv The anniversary of the Soweto student uprisings (16 June) has come to be commemorated as 'South African Youth Day'. The adoption of the Freedom Charter at the Congress of the People on 26 June 1955 is celebrated as 'South African Freedom Day'. And the launch of Umkhonto we Sizwe on 16 December 1961 (also the Day of the Covenant commemorated by Afrikaners to mark their ancestors' military victory at Blood River) is celebrated as 'Heroes Day'. xvi 1985-89 saw an escalation of right-wing vigilante attacks, sanctioned or even led by police, on anti-apartheid activists and opponents of homeland rule.